This condenser is a judging competition-level reproduction. This has the same flat extrusion as the original, with one major difference: this one has a 6-circuit coil, far surpassing the performance of the factory 3. This creates 30% more contact area, allowing higher heat transfer rates. This is an excellent choice to make if your original has seen better days or you are upgrading to R134a refrigerant. 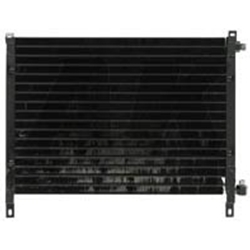 The condenser is a very key element in maintaining proper system pressure, cold temperatures, and compressor longevity.